A little girl wakes in the night to mysterious, inviting noises. She rouses her brother, and they sneak downstairs and peek into the kitchen. To their amazement and delight, their parents are dancing and singing---"?Como te quiero! Oh, how I love you!" ---as they clean up and put food away. Mama and Papa discover the two kids and sweep them into the embrace of a family dance. Slowly, the song changes to a lullaby. . . the children close sleepy eyes. . . then Mama and Papa tuck them into bed again. The story reads like poetry. The art moves from subdued tones to hot tropical colors and back again. And as you turn the pages, you can almost hear the music---changing from a pop ballad to a hot tango to a cozy lullaby. All in all, it's a perfect bedtime book, with a satisfying hugs-and-kisses ending. 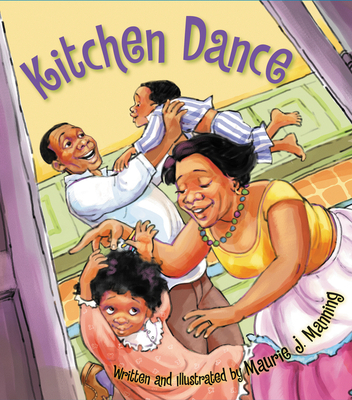 Maurie J. Manning is the author/illustrator of Kitchen Dance and has illustrated numerous other children's books, some of which she also wrote. She and her children live in Stockton, California. Visit her online at mauriejmanning.com and on Twitter @mauriejmanning.